Potent engines, heady handling characteristics, a posh ride, plenty of cabin room, solid safety scores and a wealth of high-end standard and optional features all empower the luxury-oriented 2013 Mercedes-Benz M-Class. The 2013 M-Class sport ute’s hefty price tag, lack of 3-row seating, comparatively cramped cargo area and disappointing mileage numbers from the gasoline engines can be disheartening. Loaded with luxury, features and performance, the 2013 Mercedes-Benz M-Class offers a classic blend of power, practicality and plush. Yeah, it costs a lot, but you get a lot, including distinctive styling, a choice of potent engines and traditional Mercedes safety and reliability. Heck, there’s even an available terrain-busting On/Off Road Package for those with a yen for getting there the hard way. All in all, the M-Class continues to be the SUV of choice for the discriminating family. For those folks who want a luxury-laden midsize sport utility vehicle, Mercedes-Benz has got a ute for you. The 2013 M-Class SUV seats 5 in luxurious decadence, can be delivered with an economical turbodiesel or a bi-turbocharged 550-hp V8 performance gas engine, and, of course, flaunts the M-B cachet that has become the envy of the automotive world. And all this from a relative latecomer (1998) to the realm of the rugged sport ute market. 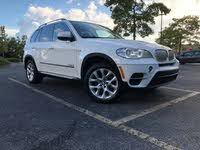 Despite its relatively tardy introduction, the M-Class has, over the years, matriculated into a solid performer and has been tweaked and prodded into the plush and princely SUV that we see today. And the beat goes on, as 2013 sees the new rear-wheel-drive-only (RWD) ML350 trim added to what had been the base ML350 4Matic. Of course, the turbodiesel-equipped ML350 BlueTEC, the mid-level ML550 and (from M-B’s racing-oriented AMG division) the ML63 AMG, still constitute the 3 higher trims in the lineup. Additionally for 2013, new and improved mbrace2 telematics technology is now standard in all trims, while the ML550 becomes eligible for a terrain-taming On/Off-Road Package that flaunts a beefed-up suspension, low-range gearing and a 6-mode selectable drive program. Also new for 2013 is a collision prevention assist feature (Pre-Safe) that initiates and modulates the pre-collision emergency braking and traction/stability control response when collision seems imminent. Of course, folks will continue to be embraced by the traditional Euro-posh as they’re swept from office to mall to concert, while drivers gain the added confidence of all-wheel-drive (AWD) capability in all versions (except the RWD-only ML350) when the going gets slick. Also returning for 2013 is the 80.3 cubic feet of cargo space all M-Class siblings boast with the fold-flat second-row seats down. And, of course, they still pack 38.2 cubic feet of cargo area with the rear seats upright. 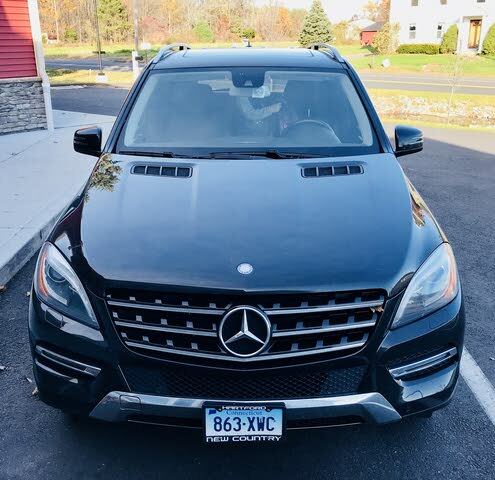 Needless to say, all this power, utility, posh and bling doesn’t come cheap, but keep in mind that this upscale Mercedes is comparably priced with such rivals as the Lexus’s heady RX 350, Acura’s sporty 7-passenger MDX, Beemer’s value-laden, 3-row X5 and Porsche’s performance-toting Cayenne. Also worth a tire kick or two is VW’s loaded-up (and considerably less expensive) Touareg. Sure, all of the above offer posh, power and prestige, but for downright distinction, few have what the M-Class flaunts in pure presence. 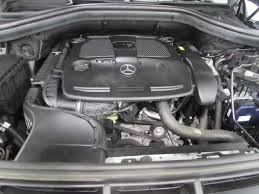 The base powertrain for the 2013 M-Class lineup is a variable-valve-timed (VVT) 3.5-liter direct-injected (DI) V6 engine mated with a standard 7-speed shiftable automatic transmission. This combo, delivered with the ML350 and the ML350 4Matic, puts out 302 hp at 6,500 rpm and 273 lb-ft of torque at 4,350 rpm, and it comes with mileage estimates of 18 mpg city/23 highway in the RWD-only ML350 and the AWD-equipped ML350 4Matic. In the AWD-toting ML350 BlueTEC edition, look for a standard 3.0-liter turbodiesel V6 to carry the load. Again managed by the 7-speed shiftable automatic, this traction-heavy trim puts out 240 hp at 3,600 rpm and a whopping 455 lb-ft of torque at 1,600 rpm. Mileage, meantime, is estimated at a pretty impressive 20/28. Moving up to the ML550, look for the twin-turbo VVT 4.7-liter V8 powerplant, again mated with the 7-speed shiftable automatic, to put out 402 hp at 5,000 rpm and 443 lb-ft of torque at 1,800 rpm. Ah, but mileage drops to a somewhat expensive 14/20 in this AWD-equipped (4MATIC) trim. Finally, the power-and-performance-oriented ML63 AMG flaunts a bi-turbo VVT 5.5-liter V8 engine that throws down 518 hp at 5,250 rpm. Again packing the standard 7-speed shiftable automatic, this muscle-bound trim blasts 516 lb-ft of torque at 1,700 rpm and can haul up to 7,200 pounds of trailer when properly equipped. Meantime, mileage estimates with the standard AWD configuration drop precipitously to 13/17. Those trims equipped with the 4Matic AWD system boast full-time AWD, with electronic monitoring that automatically shifts added torque from wheels that slip in poor conditions to the wheels that grip, with enough power that even if only one wheel remains with traction, this ute goes in the snow. An optional 4-Wheel Electronic Traction System (4-ETS), meanwhile, adds to the 4Matic modulated braking of the wheels that slip for a bit more control. Tests of the M-Class lineup found an ML350 4Matic running from 0-60 in 6.8 seconds, about average for the class. The turbodiesel-equipped ML350 BlueTEC made the same journey in about the same time, but saved some gas doing it, while the V8-toting ML550 scooted from 0-60 in a pretty speedy 5.3 seconds. Finally, the power-packing ML63 AMG shot from 0-60 in a blistering 4.7 seconds, with the addition of the optional AMG Performance Package cutting a further tenth of a second. The AMG Performance Package, by the way, adds some 32 ponies and 44 lb-ft of torque to the already sizable V8 for a top speed of 170 mph. Reviewers find the base V6 to be a tad ponderous off the line, but merging and passing on the highway present no problems. The turbocharged V6, on the other hand, though quicker from a stop, begins to taper down at higher revs. A few reviewers note that the diesel occasionally presents some miscommunication with the standard automatic transmission, with engine revs getting out of sync with downshifts. All agree, meantime, that the blown-V8-equipped ML550 offers plenty of oomph from a stop and massive reserves of passing power, while the 518-hp twin-turbo-toting ML63 AMG is described as having downright scary acceleration. All M-Class trims ride on a 4-wheel independent suspension, with a double-wishbone front end and a multi-link rear suspension as well as stabilizer bars bolstering front and rear. All but the ML63 AMG roll on 19-inch alloy wheels and tires, with the top-shelf trim boasting 20-inch alloy wheels. All trims, meanwhile, sport all-season tires. In general reviewers are pleased with the comfortable and reassuringly compliant ride offered in this high-end ute. Even the ML63 AMG, with its sport-oriented AMG suspension tuning, loses little in overall ride quality, according to reviewers. The flagship trim also offers a 3-mode (Comfort, Sport and Sport+) adjustable suspension system, with most reviews claiming that the Sport setting offers the more comfortable ride. Though reviewers opine that the lower M-Class trims aren’t quite as nimble as, say, Beemer’s X5 or the legendary Porsche Cayenne, virtually all consider M-B’s midsize ute more than adequate for the everyday drive. Body lean in the M-Class is admirably modulated, and steering is well-weighted with plenty of feedback through the wheel. Handling prowess in the ML63 AMG, meantime, is, in the opinion of virtually all reviewers, the equal of anything Porsche and BMW put out. Most reviewers also mention the fact that the M-Class boasts a turning radius that makes maneuvering in tight spaces much less a challenge than most of its competitors. Finally, reviewers claim braking performance aboard the M-Class is among the best in the business. Brakes are strong and true, with a superb feel to the pedal. In testing, a, ML350 4Matic, equipped with the standard all-season tires, came to a stop from 60 mph in a most impressive 114 feet. Luxury, class, style and distinction are what set a Mercedes-Benz product apart from the crowd, and the M-Class is no exception. The entry-level ML350, ML350 4MATIC and ML350 BlueTEC all boast a standard roof rack, power sunroof, skid plates, heated power-adjustable mirrors and a power liftgate adorning their substantial profiles. Inside, leatherette upholstery is complemented by wood, leather and alloy cabin accents and heated power-adjustable front seats. Remote power door locks and one-touch power windows again come standard, as do cruise control, steering-wheel-mounted paddle shifters, telescoping tilt-wheel steering and a universal remote garage door opener. Techno-goodies, meantime, include M-B’s brand-new Bluetooth-integrated mbrace2 hands-free telematics system that offers turn-by-turn directions and concierge service. Additionally, 100 watts of audio power support the 7-inch COMAND system’s color touchscreen audio function display, not to mention an MP3-capable single-CD player, 8 speakers, a video monitor and a memory card slot. Finally, all this is embraced by dual-zone auto climate control. Stepping up to the ML550 trim begets upgraded 19-inch AMG wheels, step running boards, rear-seat side-mounted airbags and a trailer hitch, with all items except the wheels optional for ML350 variants. From its vantage point at the top of the M-Class lineup, the ML63 AMG offers such additional bling as premium leather upholstery, sport front seats, KEYLESS-GO remote entry and engine start, front and rear parking sensors, a rear-view camera, memory for driver's settings and an auto-dimming rear-view mirror. Additionally, this top-shelf trim flaunts an 830-watt Harman Kardon premium audio ensemble boasting 14 speakers, a 6-CD changer, Surround Sound, satellite radio and a USB connection. The display screen also incorporates a standard hard-drive-based navigation suite. By the way, premium audio and the navigation system are optional in the lower trims. Despite this plethora of standard features, lower trims remain eligible for several items, either in package form or as standalone options that come standard on the flagship ML63 AMG. Heated rear seats, meantime, as well as rear-seat DVD entertainment, a heated multi-function steering wheel, massaging front seats (new for 2013), KEYLESS-GO remote entry and engine start, and Parktronic with Active Parking Assist remain available to all M-Class trims. Finally, the ML63 AMG is available in a unique designo Piano Black interior finish that features piano black lacquer wood trim matched with black leather upholstery, and each of the AWD trims, except the ML63 AMG, qualifies for an available On/Off-Road Package with a trail-ready off-road suspension and 6-mode driving program selector. Reviewers continue to praise the luxury-laden M-Class as offering what is arguably the most welcoming cabin in the midsize SUV segment. The standard high-end interior accent materials and comfortable, supportive seats perfectly balance the plush yet pleasant atmosphere, according to virtually all reviewers, though there are some who feel the abundance of buttons and controls may appear a bit overwhelming at first. A number of reviewers also comment favorably on the fact that all M-Class trims now sport a redesigned turn-signal stalk that’s been relocated to the more traditional spot on the steering column. Alas, a few reviewers are less than impressed with the available Piano Black interior accent scheme, feeling that it doesn’t quite live up to its extra cost, and cargo area is noted to be a bit underwhelming in comparison to a number of rivals. All 2013 M-Class trims remain hosts to such standard safety equipment as 4-wheel antilock brakes (ABS) with electronic brakeforce distribution, emergency braking preparation and emergency brake assist. Traction and stability control are, of course, standard, as are front and rear head airbags and front side-mounted airbags. Additionally, the ML550 and ML63 AMG sport standard rear side-mounted airbags that are optional in the ML350 stable. Daytime running lights, meanwhile, as well as front fog/driving lights, turn-signal-integrated mirrors, pre- and post-collision safety systems, mbrace emergency services, alerts and stolen vehicle recovery assist, and a remote antitheft alarm complete the traditional safety features aboard the M-Class. The 2013 M-Class ML63 AMG goes on to flaunt standard brake drying as well as adaptive, self-leveling xenon high-intensity-discharge (HID) headlights and cornering lights, all of which are optional on the other trims. Also optional lineup-wide is the Driver Assist Package, with emergency pre-collision braking (Pre-Safe), Active Blind Spot Assist and Lane Departure Warning. The M-Class once again scores high in government safety testing, with the National Highway Transportation Safety Administration (NHTSA) giving this high-end SUV its best 5-star rating overall. Front and side impact tests also gained 5 stars, while rollover tests resulted in a second-best 4-star rating. Again the M-Class garnered the Insurance Institute for Highway Safety’s (IIHS) Top Safety Pick for 2013, grabbing the Institute’s best score of Good in all testing criteria. Though most owners are happy to have an M-Class decorating the driveway, there are a few who are unhappy with, for instance, the Pre-Safe emergency pre-collision braking and Lane Departure Warning system, claiming the system is too sensitive. Another glitch some folks find irritating is the lack of standard leather upholstery in the lower trims. The plethora of controls and buttons can be confusing and frustrating, while tepid (at best) mileage numbers in the normally aspirated V6 and V8 powerplants hasn’t escaped notice by owners. Finally, a few owners complain that long-haul seat comfort could be better. 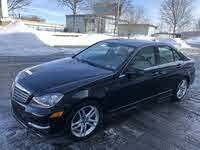 Virtually all owners, however, will accept any perceived faults in this hefty Mercedes to experience the smooth performance, posh ride comfort and admirable handling qualities that have become a trademark of the German automaker. The loads of luxury touches and techno-features, especially the well-wrought Harman Kardon premium audio system, standard in the ML63 AMG and optional for the other trims, gain their share of praise, as do those over-the-top safety scores. 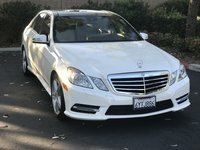 Finally, the legendary reliability, build quality and appeal of the Mercedes-Benz brand are all cited by owners as readily apparent in the 2013 M-Class lineup. What's your take on the 2013 Mercedes-Benz M-Class? Users ranked 2013 Mercedes-Benz M-Class against other cars which they drove/owned. Each ranking was based on 9 categories. Here is the summary of top rankings. Have you driven a 2013 Mercedes-Benz M-Class?